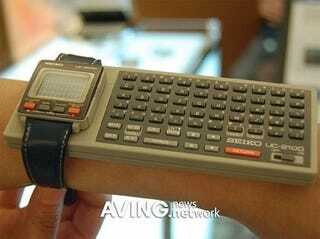 The UC-2000 or "Wrist Information System" was one of Seiko's attempts (circa 1984) to create a wearable, portable computer. Of course, you couldn't do much more than input around 2K of data, tell the time, and perform calculator functions. The picture above implies that the watch had a gigantic keyboard attached to it, which is a little misleading. The UC-2100 keyboard is actually a pocket-sized dock that is used to control the device. There was also the option of purchasing the larger UC-2200 which included a spool-fed printer, 4K of RAM and a 26K of ROM via a plug-in Application ROM pack (contained Microsoft Basic—other ROM packs included games or an English-Japanese translation app). Essentially, this keyboard turned your watch into a PC with a really, really tiny 10x4 character display.